This is College Physics Answers with Shaun Dychko. 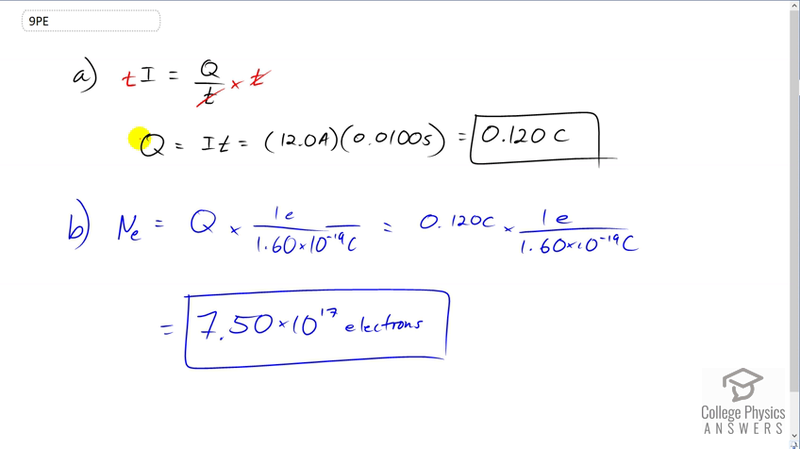 Current is charge divided by time and we can solve this for Q by multiplying both sides by t. So the amount of charge that is discharged by the defibrillator is the current multiplied by the time. So that's 12 amps multiplied by 0.01 seconds which gives 0.120 coulombs of charge. Now the number of electrons in this 0.12 coulombs is the number of coulombs multiplied by one electron for every 1.6 times ten to the minus nineteen coulombs. This is the elementary charge. So we multiply 0.12 coulombs by this fraction which is really the same as dividing by 1.6 times ten to the minus nineteen and we get 7.50 times ten to the seventeen electrons.